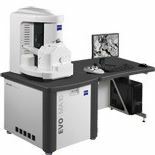 SEM works on the same principle as optical microscopy, but uses an electron beam for illumination rather than light waves. In this way, very small structures (down to a few nm) can be analyzed. In place of conventional optical lenses, magnetic fields are used for focusing. The SuSoS instrument can, furthermore, carry out EDX on any surface feature. Thus, in addition to the topography, the chemical composition of surface details can also be analyzed.